Ombre color remains one of the hottest hair color trends not only because it has so many different options, but because it can be ridiculously low maintenance. The variety of this trend can be seen in every magazine and on nearly every runway. Go bold, soft, colorful or natural with endless color choices. Ombre hair colors are a great way to rock a low maintenance look that doesn’t sacrifice style! One of the hottest trends within the ombre’ trend is to add bright vivid colors! Blonde looks amazing with ribbons of pink twisted within beautiful curls. Not a pink fan? Try lavender, mint green, coral, baby blue or pale yellow. For the cool blonde, light toned beauties with cooler undertones look best, but pink goes with any skin tone! Hair that is compromised (or damaged) will grab onto bright colors easier. Not sure if you want a bright color every day? Give it a try with clip-in extensions. Ask your stylist where you can purchase them or if they could custom make them for you in your favorite hue. Dark rich copper fades into a medium then light copper in this cool color combo. Rich and intense, this look will draw attention at school, work or a night out! Medium to dark skin tones look best in this warm color while thick straight hair will achieve this style with ease. Love the copper but want to go a bit lighter? Ask your stylist to transition this copper color in to a lighter, pale golden blonde towards the ends. Using an ombre’ technique to lighten just the very ends of your hair gives a soft glow and texture to curls. It’s a great way to try out the hottest trend! 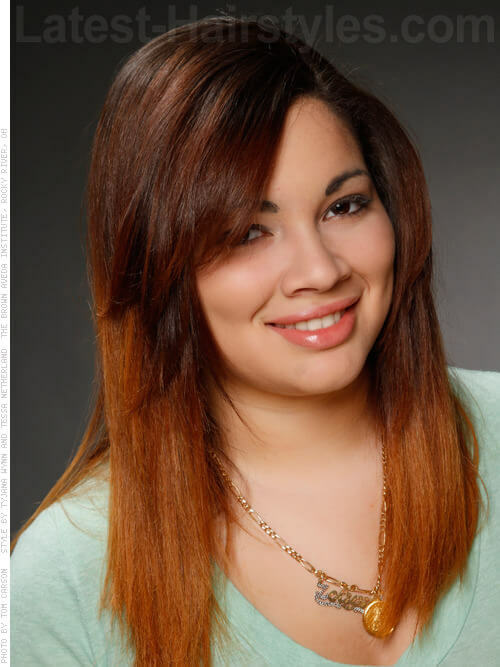 Light to medium skin tones with medium straight hair look amazing in this soft curled ombre’. Love the ombre’ but craving more? At your next appointment, let your stylist know how bold you want to go. Pictures are always helpful to get on the same page. Even if you’re far from the beach, you can achieve the ultimate beachy babe look. 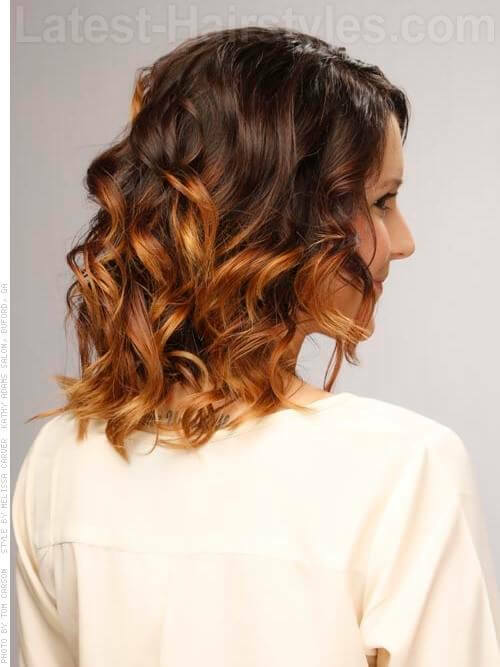 A soft transition into caramel ombre’ paired with loose curls can easily go from office to evening, or is always perfect for a day at the beach! Any shade of skin tone can wear this soft shade. Ask your stylist to match up your perfect caramel shade to partner with your natural brown, or a shade you choose. Medium to thick hair that holds a curl nicely works best for this style. If you are a dark haired beauty that colors your hair, it may take a few appointments to achieve the lightness of this look. Talk to your stylist and grab a take home conditioning treatment to keep your locks looking great. Try Pravana’s Nevo 60 Sec Deep Treatment. Ombre’ doesn’t always have to be the expected brown to blonde transition. This chocolate into cherry transition adds interest and a bit of brightness to your everyday look! It’s great for those brunette beauties who don’t want to go lighter but love the ombre’ look. Fair to medium skin tones carry the red beautifully, while hair that is thick will replicate this picture more closely. When adding red to your hair, make sure to shampoo with a color safe, sulfate-free shampoo. Try Kevin Murphy Hydrate Shampoo paired with a leave-in conditioner with UVA and UVB inhibitors to keep your red looking fabulous! 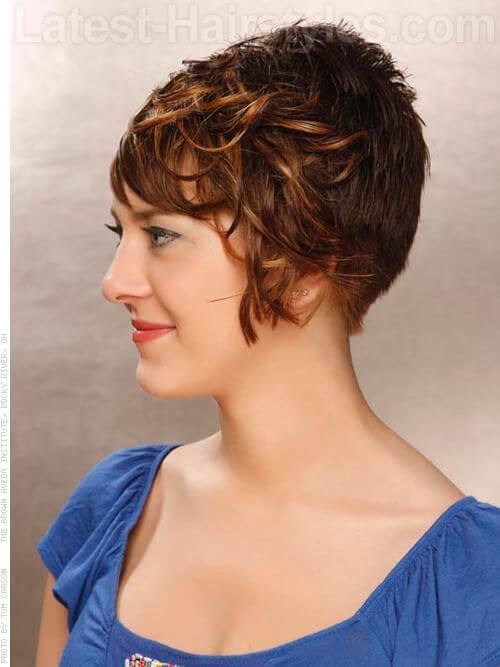 Short haired ladies don’t have to miss out on all the fun of the latest color trend! Strokes of blonde brighten this cropped look and create serious texture. Any skin tone looks great with this soft blonde gracing the ends of a chocolate brown. Short hair that is straight in texture and medium to thick wears this cropped ombre’ beautifully. Start off with just a few painted on ombre’ highlights. If your stylist gets too overzealous it can quickly turn into an all over color! Bright, platinum ends are one of the most popular colors within the super hot, ombre’ trend. 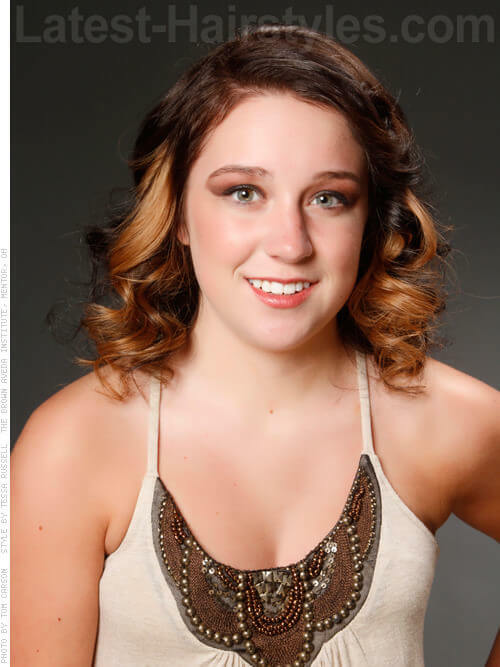 Paired with ringlet curls, this look will draw attention anywhere you go! Light porcelain skin tones make this color pop! Hair that is medium to thick and curly make styling this hot look a breeze. When lightening your ends for an ombre’ look, expect to get a haircut too. When lightening ends, it can create dryness or brittleness. Prior to your appointment, do weekly conditioning treatments to prep your ends and keep them in shape. Adding a warm brown transition from bright blonde keeps the lightness around your face and gives you an edgy look that turns heads at every bend. Reversing the ombre’ also conceals damage on ends of over-lightened hair and makes it appear thicker and smoother. Medium to light toned ladies who love their blonde but want something different and edgy look great in this reverse ombre’. Hair texture that is medium to thick and straight or wavy carries this color best. Going darker for a lot of blondes is a hard thing. Especially when you are going darker on your ends, ask your stylist to use a semi or demi permanent color. This way if you’re not 100% about your new color, it will gradually fade off with no damage. A great way to brighten up your all over look is to add some face framing ombre’ highlights around the front of your hair. These pieces are brought up closer to the scalp, just through your fringe and face frame. It’s a great way to have summer hair all year long! Light skin tones work amazing with this sandy light brown and golden umbre’, while hair that is curly or straight can wear these face framing ombre’ lights best! When asking your stylist for the face framing ombre’ highlights, discuss how heavy or subtle you want them to be. The best way to get exactly what you want is to bring pictures with you to your next color appointment. It’s hard for any stylist to agree to change out a natural redheads color, but adding a golden ombre’ is a different story! Whether you are naturally copper or carry it well, a soft transition into light gold brightens your skin tone and looks amazing. 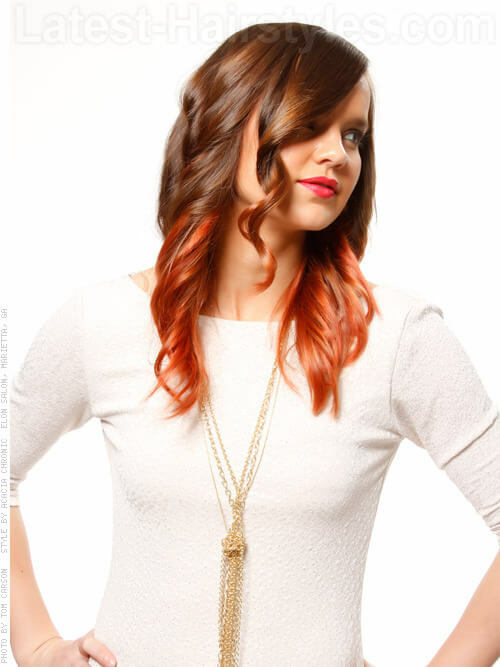 Fair skinned ladies who are naturally red (or should have been) with straight to wavy hair look fabulous in this copper glow ombre’! When lightening red and copper hair, it usually looks best with a golden hue. A platinum or ashy blonde will appear unhealthy looking paired with copper, so make sure to discuss the final result with your stylist. Soft fluffy curls paired with a honey toned ombre’ leaves you feeling like you’re walking up in the clouds! A soft transition is key with this color. Light to medium toned skin with warmer undertones looks best in this shade of honey. Mid to fine hair types will achieve this look easily with the right tools and products. Keep your finer locks healthy and hydrated with Pravana’s Intense Therapy leave-in treatment. To keep heat damage at a minimum, try some no heat options for beautiful curls. There is no ombre’ law against reversing it, and making it a soft, barely there hue. This adds interest and makes ends appear thicker. It’s also perfect for the blonde who wants something different, but loves the lightness around their face. Mid to light skin tones that love a platinum blonde look fantastic in this color. Hair that is medium thickness and wavy will hold this style all day. Want to try this ombre’ look, but scared of commitment? Ask your stylist to use a demi permanent color. The color will slowly fade off and if you love it, they can use permanent the next time. Even those with naturally beige (sometimes referred to as “dishwater” blonde) want to try out the new ombre’ trend. Why not? It looks so incredible. Lightening the ends ever so softly gives a summer glow to the hair and sets you up for summertime fun all year long! For this look, a medium to dark blonde natural hair color tends to be seen best on fair toned ladies. Curly, wavy or straight hair that is fine to thick can be lightened to achieve this fabulous, natural looking color. Love her curls? We see a lot of ombre’ styles worn curly to really show off the new lighter ends. So, it’s time to break out your old hot rollers or curling irons to bend those ends into shape. Make sure to use a heat protecting product to keep your ends looking great. Ombre’ has so many different options, one being highlights instead of a solid color. This is great to create a lot of texture with in the ends of your hair and it looks amazing curled! Dark skin tones look best with this deep chocolate brown and ombre’ caramel highlights. Hair that is medium to thick and has a curly texture look especially beautiful with these highlights. 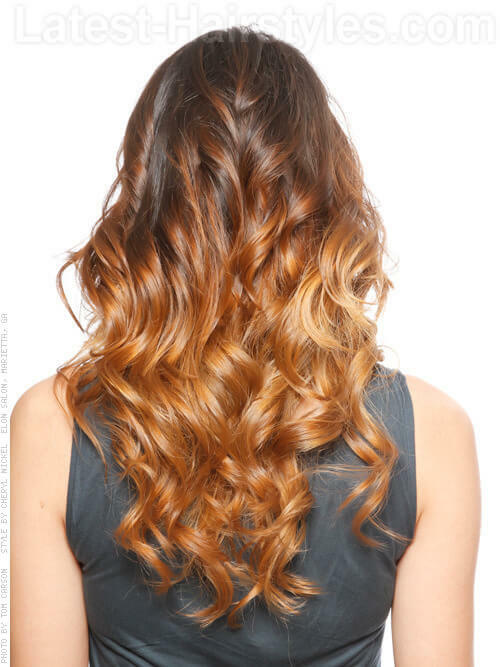 To keep naturally curly hair looking ombre’ and not a two-toned color is sometimes a task. This technique of having the ombre’ highlights keeps the curls looking their best and still creates the ombre’ effect. This reverse ombre’ with patterns stamped or painted on is a fresh take on this new trend. Let your stylist get creative! Try leopard print, flowers, patterns, hearts and more. Everyone will be jealous of your fabulous ‘do! Medium to light skin tones work best with this color palette. To achieve a pattern like this picture, you will need straight medium to thick hair texture. This may be one of the first times your stylist will be coloring a pattern on hair. Give them a heads up when you make your appointment so if they want to practice before you get there they can. Using a demi permanent color is also a good idea so it will fade away gracefully. Another great accent for dark brown hair is mahogany. It’s not too bright, but will add serious dimension and interest to your rich locks. Brunette beauties with straight, medium to thick hair, and light to medium toned skin wear this mahogany ombre’ wonderfully! Make sure to show your stylist your version of mahogany. It’s one of those colors that everyone has a different perception of. You don’t want to go in thinking mahogany/red-brown, and end up with mahogany/bright violet-brown instead. Pictures are always great for explaining color. 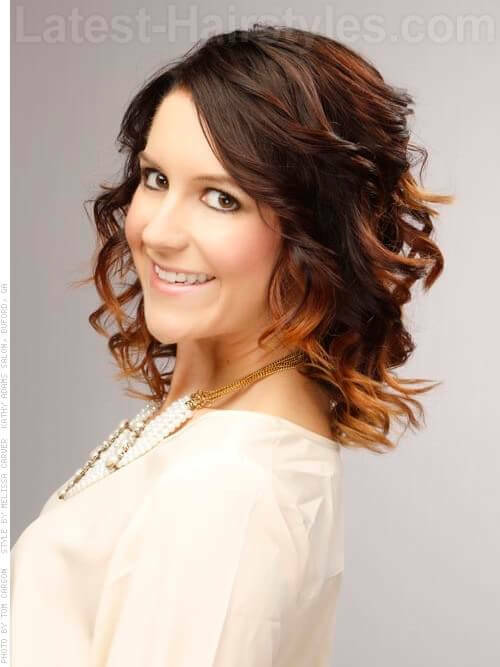 Who doesn’t love these fun playful curls paired with an amazing ombre’? A beautiful light brown transitioned into a light caramel makes this look trendy and perfect for everyday wear or a night out. Medium to light skin tones carry this color nicely. Curl that holds a curl well is key to this style, whether it is thick or finer. Try different tools to curl your hair. Curling wands create a perfectly undone curl, while a flat iron can create natural looking curls as well. A smooth, seamless transition from a natural medium blonde to light beige is simply perfection with this color trend. Compliment the color with soft waves and an a-line bob for a sophisticated and flirty look. Fair skin tones look best in this light, soft blonde. Hair that is medium to fine in texture and straight to wavy will be a breeze to style in this hot look. Lightening finer hair can be tricky. Talk to your stylist about maintaining the integrity of your hair. Ask for a treatment you can use weekly and a heat protection spray to protect your ends while waving. This colorful look will turn heads everywhere you go! 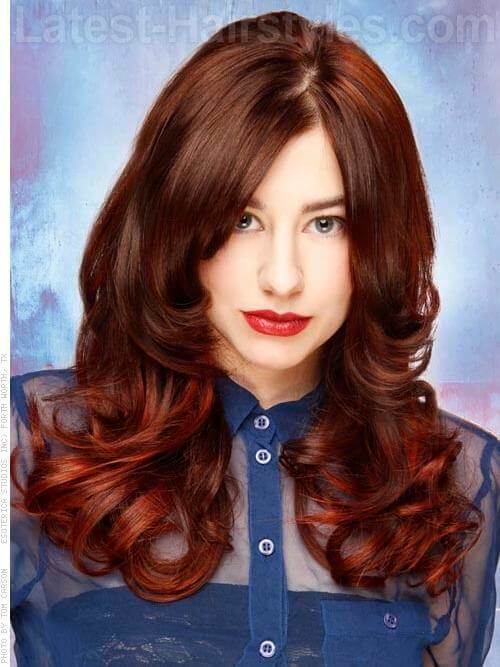 Fiery copper warms up your face and adds brightness to beautiful brown hair. A light skin tone works best with this gorgeous copper while hair that is fine to medium in thickness and straight makes this style easy to achieve. Copper not your thing? Try fire engine red, bright violet red or even bright gold! The color choices with ombre’ are endless. Not everyone wants to be bold. This soft ombre’ hair color looks very natural and will brighten your hairstyle right up. Be ready to answer the question, “did you do something different?” over and over again! 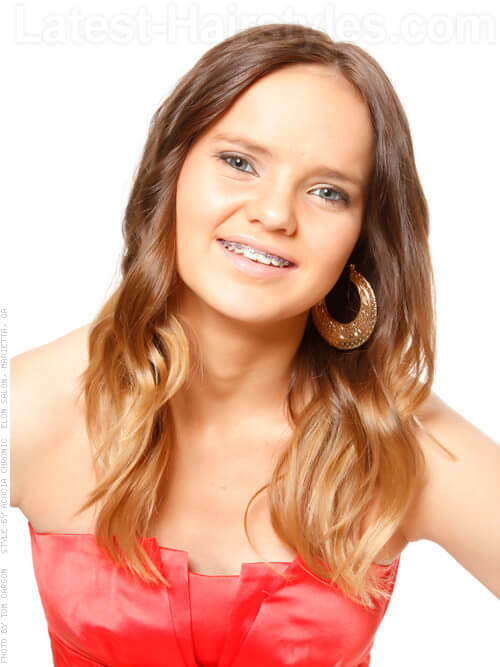 Medium skin tones that just need a little extra brightness look great with this natural ombre’. Hair that is finer in texture and straight to wavy will style perfectly with these soft waves just at the ends. This is a great look to start with if you’re not sure about ombre’. At the following appointment, you can always go a bit lighter. Every teenager wants this ideal ombre’! Moms love it for the easy upkeep and teens love keeping in the latest style. It’s a win/win combination! Any skin tone can wear this pretty blonde ombre’. Hair that is medium thickness and straight to wavy will find styling these beachy waves a breeze! Make sure to ask your stylist about what products you need to keep your hair looking great. A weekly deep conditioner, heat protectant and flexible hair spray will be key to easy maintenance. Ombre’ can be a darker color into lighter, or flip it to lighter to darker! This is a great way to add interest to your look while still maintaining lightness around your face. It also helps to make ends appear thicker and less damaged. Medium to light skin tones wear these rich chocolate ends beautifully while hair that is thick and holds a curl well will achieve bouncy curls all day. If going from an all over blonde to dark ends, it may take more than one appointment to keep the brown from fading. A sulfate-free, color safe shampoo is important to help keep the fading at a minimum. Try Pravana’s Color Ensure Shampoo and Conditioner. Soft ribbons of blonde wind through the ends of this princess’ hair. The ribbons are brought up closer around the face to brighten and create more texture. 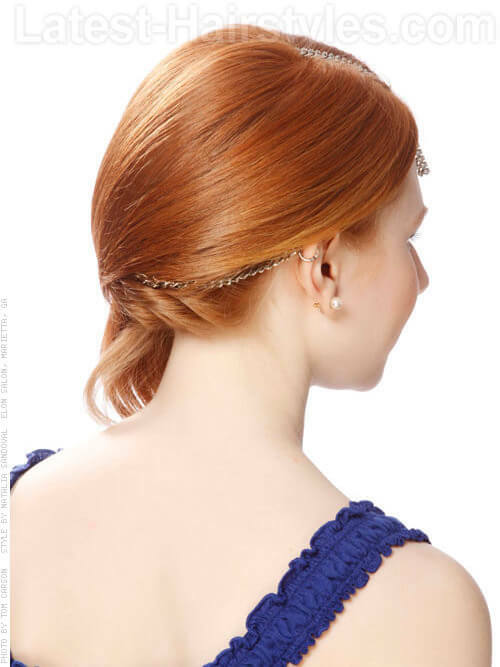 Beautiful curls are wound together and pulled to the side for a modern, fairytale style. Fair skin tones look best in this soft flowing hair while hair that is medium to thick in texture and straight or wavy will style easily. 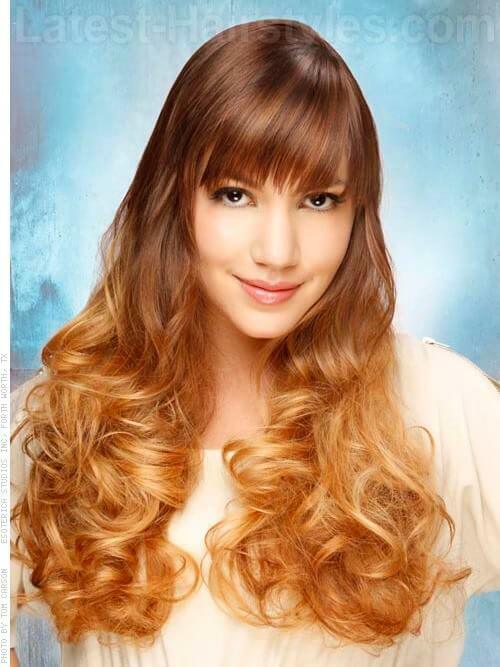 Multi tones of blonde, caramel and chocolate intertwine to create this rich ombre. To replicate, make sure to bring a picture to your stylist. Rich chocolate brown fading down into a natural blonde not only brightens your face, but also brings your summer color to life. Dark to medium skin tones that have medium to thick straight hair will look amazing with this pretty ombre’. When lightening your dark locks, remember to keep up on trims. Waiting too long in between appointments can cause damage and split ends to be the focus of your hair instead of your amazing color! A soft natural blonde evolving into a rich dark brown gives your hair an edgy look that can be worn day or night. 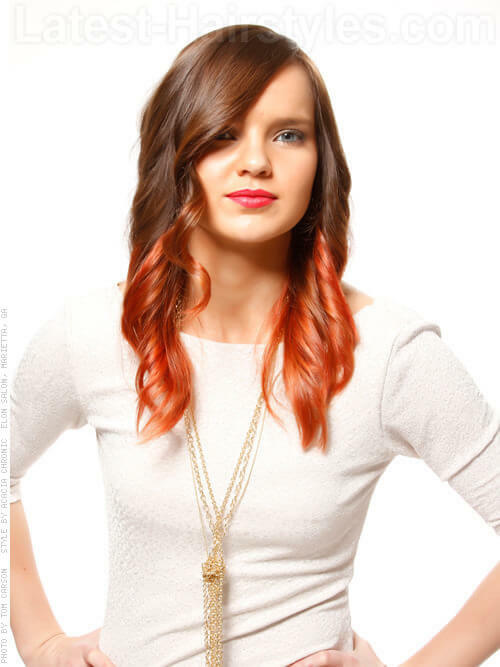 Curled, straight or braided, this color will turn heads everywhere you go! Medium skin tones will glow with this edgy ombre’. Straight or wavy hair that is medium to thick in texture will achieve this look effortlessly. Adding a few lowlights into the blonde near the scalp helps with the transition of this color. Make sure to talk to your stylist about how light you want your blonde and how dark you want your lowlights to avoid too light or dark of a color. Golden hues create an interesting and face flattering ombre’. Golds and soft copper intertwining and coming up around the face brighten and create a glow this season. Fair skin and natural redheads wear this color beautifully while fine to medium hair that is straight or wavy will be able to achieve this style with no trouble. To keep coppers looking great, make sure to use a sulfate-free, color protecting shampoo. Try Pravana’s Color Ensure paired with Intense Therapy Leave-In Treatment for long lasting color. Dark to intense light creates a bold statement in this contrasting color. Perfect for the fashion forward diva who isn’t afraid to draw attention to herself! Medium to light skin tones carry this bold color perfectly while hair that is medium to thick with natural waves will make this style easy to achieve. Sometimes you have to lighten dark colored ends in more than one appointment. This ensures your ends will stay in great condition and not become over processed. 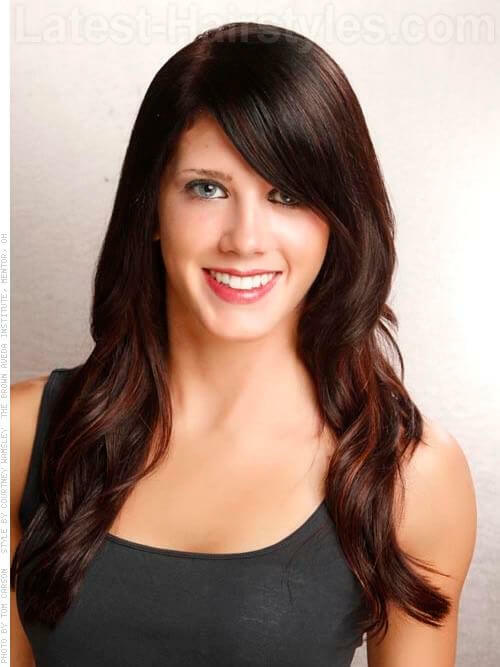 Talk to your stylist about a realistic time frame to achieve your target color. With ombre’ there are no rules! Going from a rich cherry into a dark cola color looks amazing and will be a breeze to maintain. Darker skin tones look amazing topped with a soft red melting into dark rich cola. Hair that is straight and thick will show this color off best. Even if mother nature has blessed you with a few grey hairs, ombre’ can still work for you! 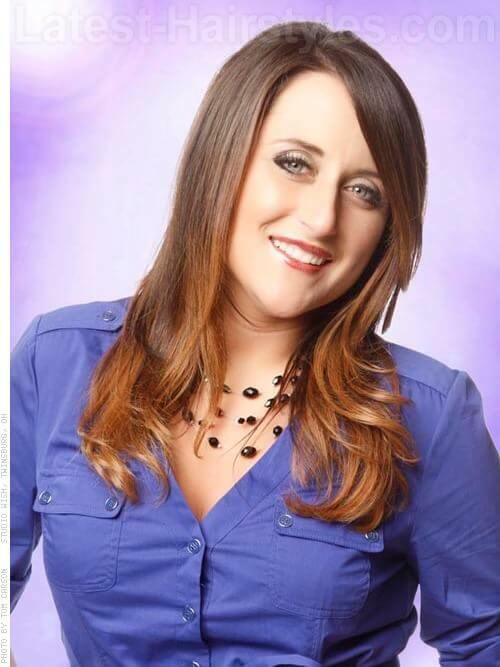 With this color, have your stylist formulate a permanent color to cover the unwanted grays and enjoy your new look. This sixties-inspired ombre’ will keep you feeling like a Bond girl for a girls night out, wedding or day at the office. Medium to light skin tones wear this golden brown to cool blonde ombre’ amazingly. Hair that is medium to thick and has a natural wave will hold this volumous style well. Volume is the key to this style! Start off with root volumizing foam paired with a thickening cream. Blow dry hair using a medium to small round brush, creating the most volume towards the top and crown. Finish off your look with hot rollers or curling iron. Ombre’ hair color is here to stay, so why not freshen up your look and give it a try? With so many color combinations and placement options, your hair can easily transform to bold and bright or soft and natural. Just remember to treat your color and newly lightened (or darkened) ends well. Using sulfate-free shampoos and making appointments for regular trims will keep your hot new hue looking great!